Explore the hills and mountains of Croatia's southern adriatic islands from the comfort of your computer, tablet or smart phone with these virtual reality tour following the two key routes to the summit. These tour are now supported by most modern HTML5 compatible browsers, including those on tablets and mobile phones. When viewed on mobile phones equipped with the appropriate gyros, these tours are also compatible with Google Cardboard VR, and other headsets. Float cursor over picture button below to view start location (allowing time for Google Map to update) then click to start tour in a new window. My wife holds fond memories of a school trip to the Island of Vis and had for many years been keen to take us their too. 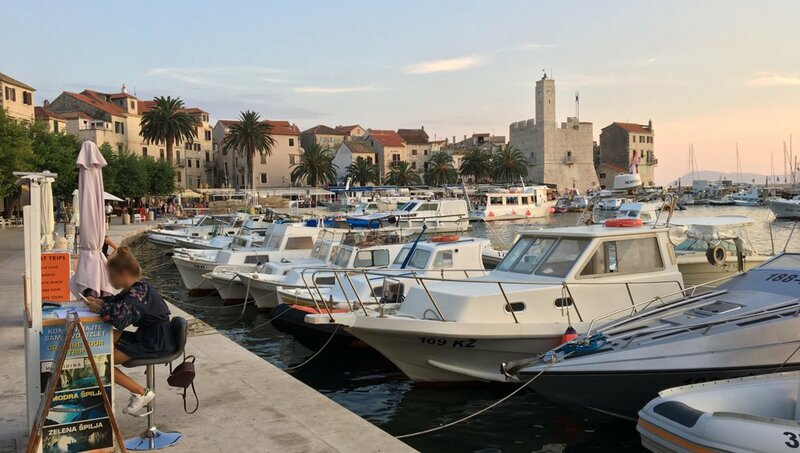 In spring 2018 we booked the Jadrolinija ferry from Split and an apartment for four nights in the town of Komiža. Vis is the farthest inhabited island off the Croatian mainland and has long had military significance. Indeed, from the 1950s until 1989 no foreign visitors were permitted. The old Yugoslav army base upon the summit of Hum, the island's highest point at 587m, remains off limits, and so the Croatia Mountaineering Society placed HPO 16.7 outside the nearby chapel of Sveti Duh. The name translates to "the Holy Spirit". Three days into our stay on the island, my wife and eldest son went scuba diving, and thus came the opportunity for my youngest and I to explore the island's baked interior. We set off with plentiful water supplies following Ulica Dr. Anta Starčevića out of the Komiža, and a short while after began following the well-marked, if sometimes over grown path, between the folds of Hum's eastern flank. It was hot. Very hot. We slowed the ascent and took brief rests in whatever shade we could, noting as we did so the increasingly frequent trampoline like structures in the undergrowth. Trampolines of web that folded into tubes, funnels to be more precise. My mind conjured up uncertain images of the notorious funnel web spider. Were their bites not poisonous? Looking skyward one could also see webs strung between the trees, their arachnid builders waiting patiently in their centres. As the path zig-zagged towards a pass below the military base, the view opened and within a short time we arrived at the stone chapel of Sveti Duh. We stamped our log books using the metal die cemented into the low wall outside the chapel and ate lunch in the shade at it's rear. Here we enjoying the view of Komiža, the sea, and further islands before setting off again once more under the backing sun. Rather than retrace our steps, our plan was to make a loop, visiting the caves were Marshal Tito, (the partisan resistance leader) had a secret base during the second world war, and then heading northwards to the main road that links Komiža and the Vis (the town) and thus bisecting the island, before heading westward and with a twisting descent back to our holiday apartment. At Tito's caves we met the only other people on our walk thus far. A German tourist group who had approached the historic site by minibus and rather burst our bubble on telling us that there was no roadside cafe at which we could purchase a chilled drink. 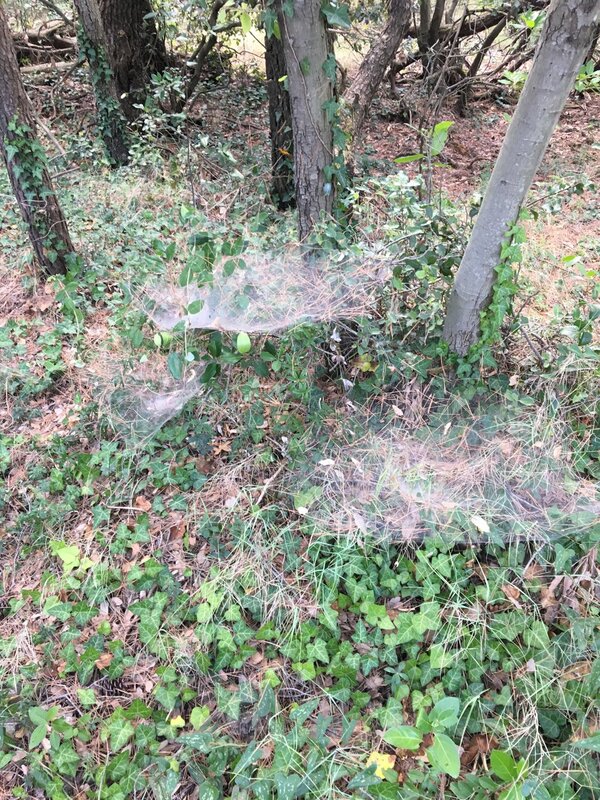 Funnel webs, the spiders of Hum. It was on leaving Tito's caves and heading north that we were transported to the Mirkwood of Tolkien's Middle-earth. The spider's web cloaked the path on either side, often leaving across it. The pace slowed as every few steps required clearing the way of the sticky strands and their owners. With some relieve we arrived on the main road, the 6212, that bisects the island linking Komiža with the capital city Vis. A short but thirsty walk up hill along the 6212 brought us to a wonderful view point over looking Komiska Bay, and the island of Biševo beyond. The road here flows downhill in a series of serpentine bends into town. Our route followed older, more direct tracks. The photos for the tour were taken on a Ricoh Theta S 360 degree panoramic camera.